When Rihanna released her range, Fenty Beauty everyone was waiting in anticipation to see exactly what was going to be included. This was a very different release as no one knew what was to be released until the actual launch day. Then when it all dropped on the 8th September 2017, one of the standouts that was streamed all over social media was the Killawatt Freestyle Highlighter in the shade, Trophy Wife. The Killawatt Highlighters are described as being ‘born to reflect your every mood with its lineup of luminizing solos and duos. With a dose of skin-glorifying colour, Killawatt ranges from subtle dayglow to insanely supercharged with shades that were designed for all skin tones’. At brownbeautytalk we decided to try out the now famous Trophy Wife Highlighter, which is described as a 3D Hyper-Metallic Gold. The highlighter appears to have a slight green undertone to it, which may be slightly tricky to wear for some skin tones. Although Fenty Beauty describe their highlighters as having ‘superfine shimmer for an ultra-smooth, creamy texture’, I found that even though this appears to be the case in the pan, when applied to the face Trophy Wife definitely has very noticeable glitter particles. Of all of the highlighters Trophy Wife is definitely the most intense, and I’d say the one that would be most tricky to wear due to its high level of glitters and striking gold colour. However, I did like it and even though it’s intense I found it to be wearable – but for my personal preference it wouldn’t be an everyday highlighter. I actually enjoyed using this more as an eye shadow, especially as an inner corner highlighter on the eyes. This would also make a very stunning body shimmer on the collarbones or shoulder blades. All of the Killawatt Highlighters come packaged in a white hexagonal compact with a very slight pink/gold shimmer shift. They also have a full size compact mirror on the inside too, making them great for travelling. Trophy Wife is definitely a fun highlighter to add to your collection, but if you do, remember that it’s better to start with a little as that goes a very long way. 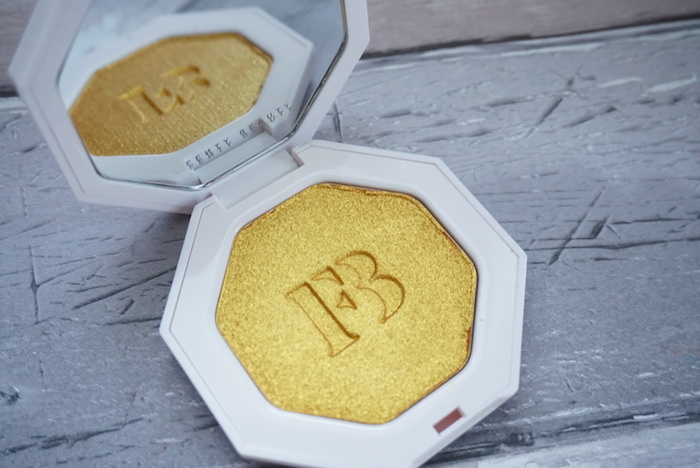 Fenty Beauty Killawatt Freestyle Highlighter Trophy Wife is priced at £26.00 and can be found online and at Harvey Nichols.